LONDON, Nov 8, 2018 - (ACN Newswire) - UK adspend rose 6.4% year-on-year to reach GBP 5.6bn in Q2 2018 - the 20th consecutive quarter of market growth. Coupled with an overall adspend rise of 7.2% year-on-year during the first half of 2018, to a total of GBP 11.4bn, this was both the strongest second quarter and first half since 2014. 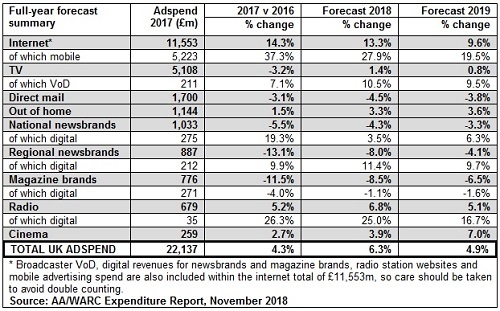 This record investment, highlighted in Advertising Association/WARC Expenditure Report data, published today, means full-year outlooks for 2018 and 2019 have been upgraded to +6.3% and +4.9% respectively. This would lead to a projected adspend total of over GBP 23.5bn for 2018. Overall market growth is being driven by increased spend on online advertising. 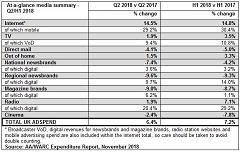 Internet advertising - inclusive of online revenues for newsbrands, magazine brands, broadcaster video-on-demand and radio station websites - continues to grow at a rapid rate and consequently full-year projection figures have been upgraded by three and a half points to 13.3% growth this year. This would result in over GBP 13bn being spent on online advertising in the UK this year. The TV market grew ahead of expectations in the second quarter of 2018, with total spend rising 1.9% to GBP 1.2bn. 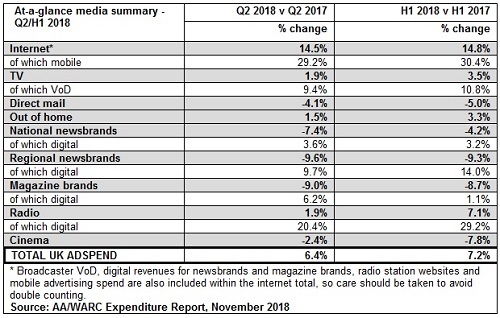 Spot advertising - 89% of the total - rose for the third consecutive quarter, and the 1.4% growth rate was ahead of forecast. "Spend on advertising is showing real strength and resilience especially at a time of some uncertainty for UK business. We know advertising has a positive effect on the economy, with GBP 1 spent generating GBP 6 for UK GDP, so it is encouraging to see the strongest Q2 and H1 results since 2014. We are the only organisation that brings together agencies, brands and media to combine strengths and seek consensus on the issues that affect them. Through wide-reaching engagement and evidence-based debate we aim to build trust and maximise the value of advertising for all concerned.